This is an affirmative (or positive) sentence. How can we make this affirmative sentence (+) a negative sentence (-)? We normally use Don’t or Doesn’t to make a negative sentence in the simple present tense. Let’s look at the difference between DON’T and DOESN’T. We use Don’t when the subject is I, you, we or they. We add don’t between the subject and the verb. You see that don’t makes the sentence negative when the subject is I, You, We or They. Now let’s look at third person sentences using he, she and it. Again, we add doesn’t between the subject and the verb to make a negative sentence. Notice how the letter S at the end of the verb in the affirmative sentence (because it is in third person) disappears in the negative sentence. The verb after the negative don’t or doesn’t is the base form of the infinitive. Remember, the infinitive is the verb before it is changed. To go, To need, To speak, To live … these are all infinitives which means that they are the original form of the verb before any changes. We know they are in the infinitive form because of the TO at the beginning. But for negative sentences we want the BASE form of the infinitive. This means the infinitive without TO. Instead of To go, it is just go. Instead of To speak, it is just speak. Third person verbs lose the final S in negative sentences. Again you can see that in the negative sentence, speak does not have an S at the end because it is the base form of the infinitive. What is the negative of this? Phillip doesn’t need a dictionary. Now let’s look at some verbs that change a little more. The first one is the verb To Have. I don’t have a new bike. The infinitive is To Have but we just need its base form … have. But let’s look at the third person, for example with He. He has a new bike. He doesn’t have a new bike. We NEVER say: he doesn’t has a bike. Why do we use HAVE in the negative and not HAS? Because the verb after don’t or doesn’t is the base form of the infinitive. The infinitive of has is To have. Let’s make negatives sentences with the verb To Go. To Go is the infinitive. Its base form is just Go. I don’t go to the beach. Daniel goes to the beach. Goes is used with he, she, or it. Daniel is He. How can I change this to a negative sentence? Daniel doesn’t go to the beach. Go because it is the base form of the infinitive. 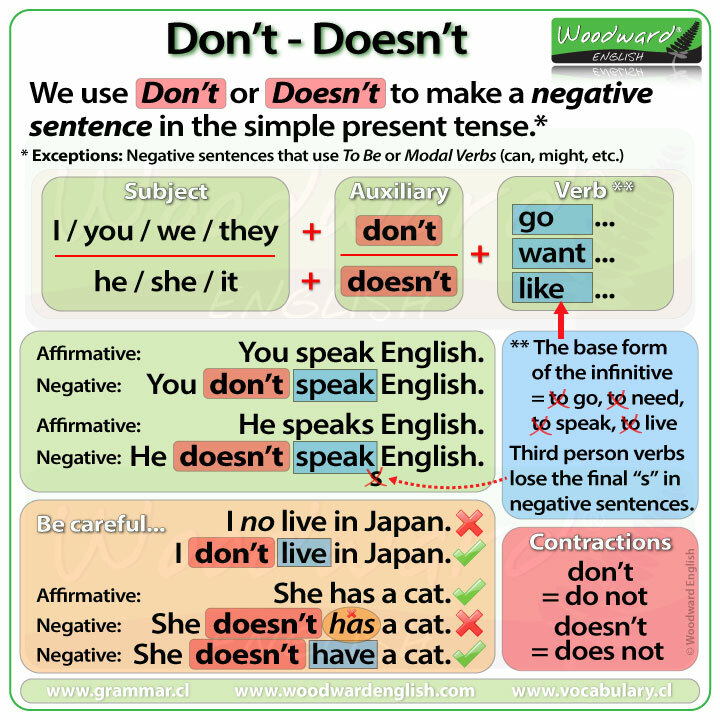 We use Don’t and Doesn’t to make negative sentences in the simple present tense EXCEPT with the verb To Be and Modal verbs such as can, might, should etc. which we will see in another lesson. We don’t say: I no live in Japan. This is NOT correct. We say: I don’t live in Japan. This is correct. We say: She has a cat. We do not say: She doesn’t has a cat. This is NOT correct. We need the base form of the infinitive which is HAVE and not has. The correct way is: She doesn’t have a cat. I don’t speak Japanese. = I do not speak Japanese. He doesn’t speak Korean. = He does not speak Korean. There is no difference in meaning though we use contractions a lot in spoken English. Complete the following sentences with don’t or doesn’t. I live in a house. I _______ live in an apartment. You _______ need a dictionary. We _______ have cake for breakfast. It _______ rain much in summer. Jack and Jill _______ want to go up the hill. Mike lives in New Zealand. He _______ live in Australia. The answers appear in the video.